Trade union sockpuppet, Hope not Hate, have again tried to use the tragic murder of Jo Cox as a campaigning tool in an email which must surely disgust even their most devoted supporters. 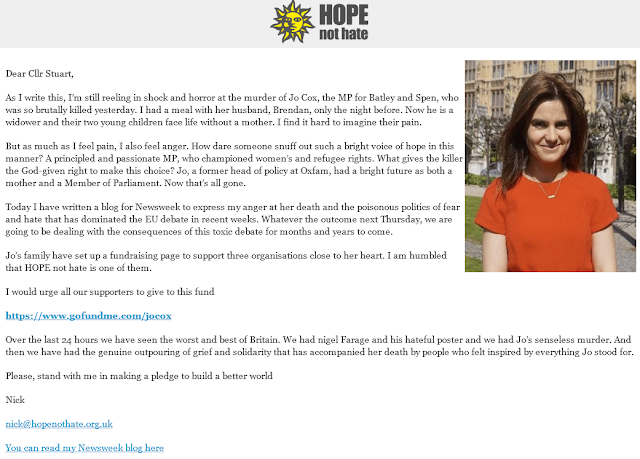 Hate not Hope's chief executive, Nick Lowles, has sent an email to supporters asking for donations to a memorial fund which he will get a share of, linking her murder to the EU referendum and attacking Nigel Farage. He also plugs an article he's written for the Newsweek website in which he again attacks UKIP and Nigel Farage. This disgusting little man has - three times now that I know of - used the murder of Jo Cox as a campaign tool in the last 24 hours. This is at a time when both sides of the EU referendum campaign (UKIP included) have agreed to suspend campaigning as a mark of respect for the death of this lady. Not only is Nick Lowles unwilling to respect that decision, he is even seeking to profit from it by urging people to donate to the fund that he will share. Surely even the most diehard Hate not Hope supporter can't continue to support this appalling man.